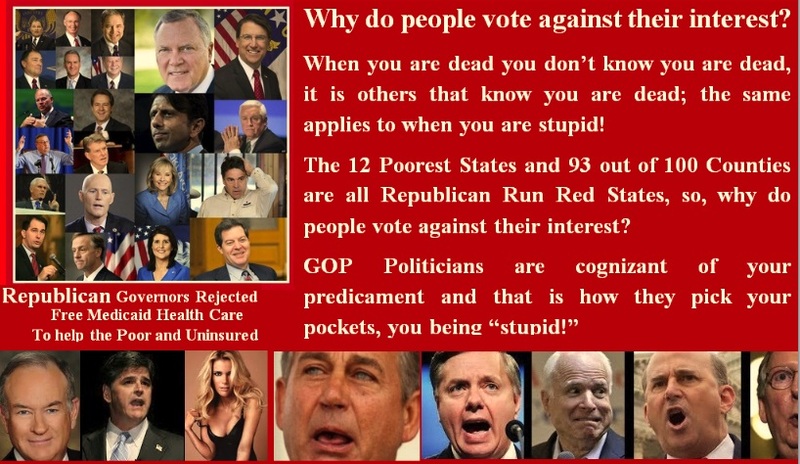 Why do people vote against their interest? When you are dead you don’t know you are dead, it is others that know you are dead; the same applies to when you are stupid! The 12 Poorest States and 93 out of 100 Counties are all Republican Run Red States, so, why do people vote against their interest? I do not only castigate only Republicans because there are Democrats who do the same thing. The worst part about the Democrats is that they seem to be trying to walk on both sides of the street at the same time. As for the GOP they are degenerates but they do not hide it, what they do is take advantage of the people that they have brainwashed with hate and disenchantment solely because those people are uninformed, mostly uneducated and their ideology about the “master-race,” still resides with them. Khaled Mashaal was nearly assassinated by Benjamin Netanyahu. Then Israel’s Prime Minister was forced to bring the Hamas leader back to life. Now their deadly history hangs over the conflict that roils the Middle East. khaled Mashaal lay dying in a hospital bed as poison flowed through his bloodstream, slowly shutting down his respiratory system. With a machine pumping air into his lungs, he had, at best, a few days to live. An antidote could save the Hamas leader’s life. But the only person who could provide it was the very man who had tried to kill him: Israel’s Prime Minister, Benjamin Netanyahu. As the clock ticked down over four days in late September 1997, with Mashaal unconscious and steadily deteriorating, Netanyahu faced an excruciating choice. The Mossad agents who had sprayed poison into the Palestinian’s ear on a street in Amman, Jordan — in retribution for a series of suicide attacks within Israel — had been captured while fleeing. Jordan’s King Hussein vowed to put the Israelis on trial if Mashaal expired. The agents would likely face execution if convicted. Desperate to avert an international crisis that would derail his efforts to broker peace deals between Israel and its Arab enemies, President Bill Clinton intervened, insisting that Netanyahu, then serving the first of his two tenures as Israel’s prime minister, provide the antidote The Israeli leader grudgingly complied, even traveling to Amman to issue a personal apology to the King. Mashaal was revived, his stature forever enhanced as “the living martyr.” Instead of killing one of Israel’s most despised enemies, Netanyahu had resurrected him. Today, Khaled Mashaal and Benjamin Netanyahu are again adversaries in an international crisis, as Israel wages war with Hamas in what might be its bloodiest fight yet against the militant group that controls the Gaza Strip. In the 58-year-old Palestinian, who is now Hamas’s political leader and most visible spokesman, granting interviews to the likes of Charlie Rose and the BBC, Netanyahu faces an enemy who has only grown in stature since their existential encounter. Although he does not rule Hamas by fiat, Mashaal “is one of the most influential figures in Palestinian politics,” says Nathan Thrall, a Jerusalem-based analyst for the International Crisis Group. Thrall says Mashaal is even a plausible candidate to lead the larger Palestinian national movement once the presidency of moderate Palestinian Authority President Mahmoud Abbas, who is 79, has ended. Both Israel and the United States consider Mashaal a terrorist, linked to multiple deadly suicide bombings and thousands of rocket attacks against Israel. (Netanyahu ordered his assassination after one particularly awful explosion in a Jerusalem market killed 16 and injured 169.) Whether he is an incurable fanatic or a pragmatist capable of moderation is a subject of debate within Israel and beyond. In public remarks since the start of this month’s fighting, Mashaal has rejected any cease-fire that does not bring a fundamental change in Israel’s position towards Hamas and Gaza. “We will not accept any initiative that does not lift the blockade,” Mashaal said in Qatar on July 24. But some analysts believe that Mashaal, who lives in exile in the Qatari capital of Doha — where he has met with Qatari and Turkish diplomats working with Secretary of State John Kerry for a ceasefire — is more willing to strike a deal than leaders of Hamas’s military branch. “The political wing seemed ready to stop this earlier, including Mashaal. The military wing has not been, and is calling the shots,” says Dennis Ross, a longtime U.S. Middle East peace negotiator now at the Washington Institute for Near East Policy. Perhaps, but one Israeli government official describes Mashaal as a “radical” whose views differ little from those of Hamas’s Gaza-based military commanders. And undermining Mashaal has become a central component of Israel’s wartime public relations effort, which portrays the Palestinian as a kind of limousine jihadist. “This guy Khaled Mashaal, he’s roaming around, five-star hotel suites in the Gulf states, he’s having the time of his life, while he’s deliberately putting his people as fodder for this horrible terrorist war that they’re conducting against us,” Netanyahutold CNN on July 20. A few days later, two Gaza television outlets aired a peculiar clip of Mashaal speaking in public. “In the name of Allah, most gracious, most compassionate,” he began, “I want to start by thanking the excellent staff of the kitchen at my hotel.” He went on to explain that his hotel room had cost as much as “a hospital and three tunnels in Gaza.” According to the Jerusalem Post, Israeli operatives had hacked into the television networks and broadcast the hoax video, dubbing fake audio over authentic footage. Some analysts say that such ridicule may resonate with Palestinians. Mashaal has spent virtually no time in Israeli-occupied areas since his family fled the West Bank, where he was born, during the 1967 war between Israel and its Arab neighbors. Mashaal first moved to Kuwait, where he joined the Muslim Brotherhood at age 15, then earned a physics degree and worked as a teacher. He later moved to Jordan, where he led Hamas’s powerful branch in the country, then to Syria and, in January 2012, fled that country’s civil war for Qatar, whose government funds and supports Hamas. Mashaal’s visit to Gaza later that year — facilitated by the Muslim Brotherhood regime that then ruled neighboring Egypt — was his first and only known visit to the besieged Palestinian territory. That’s a problem for Mashaal’s street cred, according to Thrall. “Hamas’s popular support derives from its perceived authenticity and close connection to the grass roots, much of which is impoverished and resides in shabby refugee camps in Gaza, Syria, Lebanon, Jordan, and the West Bank,” he says. Little wonder, then, that Mashaal’s enemies keep up the campaign of mockery. Pro-Israel tweeters circulate a photo of Hamas officials in the cabin of a private jet, with a large large chocolate cake waiting to be eaten, claiming Mashaal is among them. But it’s difficult to wholly discredit a man who forced an Israeli prime minster to give him a “second birth,” as Mashaal puts it. The near-death experience is not forgotten in the Arab world. Just last year Al-Jazeera aired “Kill Him Silently,” a 90-minute documentary recounting the story. It features a re-enactment of how two Mossad agents lay in wait outside Mashaal’s office on the morning of September 25, 1997. As he approached, one sprayed the painkiller fentanyl into Mashaal’s ear from a device disguised under a bandaged arm. The Israelis had hoped that their lethal dose of modified fentanyl — up to one hundred times more potent than morphine — would send Mashaal into a nap from which he would never awake, and that the agents would slip away, leaving no evidence of foul play. But the plan went awry from the start. Mashaal’s bodyguards were suspicious of the Mossad agents even before their assault, and were able to chase and capture them. (Three other agents would later be found elsewhere in the city; all had entered Jordan using Canadian passports.) Mashaal knew the assailants had tried something strange, but thought they had failed to harm him. “I felt a loud noise in my ear,” Mashaal later said. “It was like a boom, like an electric shock. Then I had shivering sensation in my body like an electric shock.” But he was otherwise fine — or so it seemed. Only when he developed a severe headache and began to vomit later that day did Mashaal understand that the attack did, in fact, pose a threat to his life. Clinton mediated the ensuing diplomatic crisis in a furious effort to salvage a major peace agreement between Jordan and Israel that would be inked only weeks later. Netanyahu ultimately provided the antidote formula to Jordanian doctors, who would not trust any chemical supplied directly by the Israelis. He also apologized in person to the brother of the King, who refused to see him. Mashaal emerged a hero. He would assume Hamas’s top political post seven years later, in 2004, after the Israelis — this time dispensing with cloak-and-dagger technique — killed his predecessor, Abdel Aziz al-Rantisi, by firing missiles at his car from helicopter gunship. (Al-Rantisi, as fate would have it, was released from an Israeli prison in the 1997 deal to save Mashaal’s life.) “A lot of people have underestimated [Mashaal], but he has proved very adept despite extraordinary challenges,” says University of Maryland professor Shibley Telhami, including “his distance from Gaza and its leadership.” Reliable polling among Palestinians is scarce, but the wild cheers that greeted Mashaal as he stepped from the model rocket in Gaza speak to his popularity. Netanyahu might describe that as a nightmare, though other Westerners are more hopeful. Underlying Mashaal’s public calls for the destruction of Israel are more nuanced positions. He has distanced himself somewhat from Hamas’s charter, filled with bigoted language about “World Zionism” and “warmongering Jews.” And he has offered a hudna, or long-term truce with Israel in return for an Israeli withdrawal to its 1967 borders and the right of return for Palestinian refugees. Netanyahu may yet attempt to complete his unfinished business. Killing Mashaal in Qatar would create another dangerous diplomatic crisis. But Israel’s Foreign Minister, Avigdor Lieberman, believes it should be done anyway, according to a July 21 report by Israel’s Channel 2. And Mossad agents drugged and suffocated the leader of Hamas’s military wing in a Dubai hotel in March 2010 (an incident famous for security camera footage that captured much of the operation). 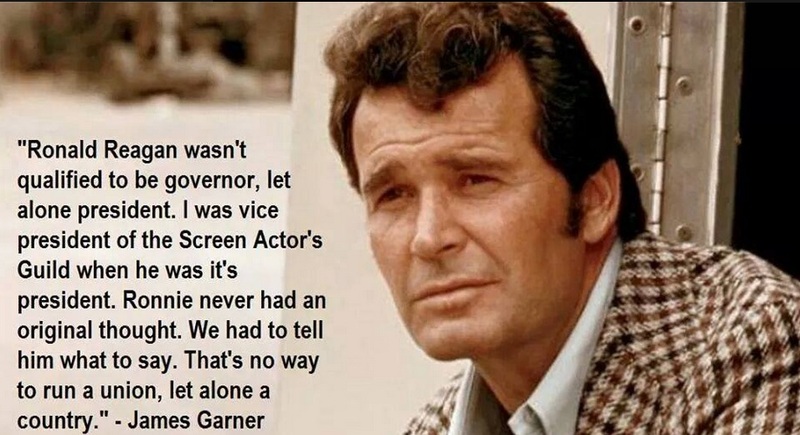 The Great James Garner departed this world but his words live on about the Republican Greek god, Ronald Reagan! Republicans and their mouth-piece Fox News preach every day about Impeaching President Obama, and the Do Nothing Congress led by the Professional Drunk John Boehner plan on suing Mr. Obama. Their claim is that Obama violated the Constitution by signing executive orders even though Obama signed the least executive order as compared to any previous President in the past 100 years. One terrorist tragedy in Benghazi that killed our Ambassador and three other Americans and now going on two years, the Republican Congress cannot stop searching for dirt. Well, let us take a look at Fox News and the Republican Greek god, Ronald Reagan, because after all, these people worship this man as though he was really God. Here are facts, not phantasmagoric rationales or internecine narcissism. Iran Contra: 14 Convictions; HUD: 16 Convictions, 8 Billion Dollars; Savings and Loan Bank: 32 Convictions with a cost to the Tax Payers of 1.5 Trillion. Our National Debt was 930 Billion when Reagan was sworn in as President and when he left on January 20, 1989, our National Debt was 2.7 Trillion. And about those Iran Contra Convictions, George Herbert Walker Bush on January 20, 1993, hours before Bill Clinton was sworn in, Old Man Bush Pardoned all 16 Convicts. The Republican Out-Cry, well, we are still waiting. 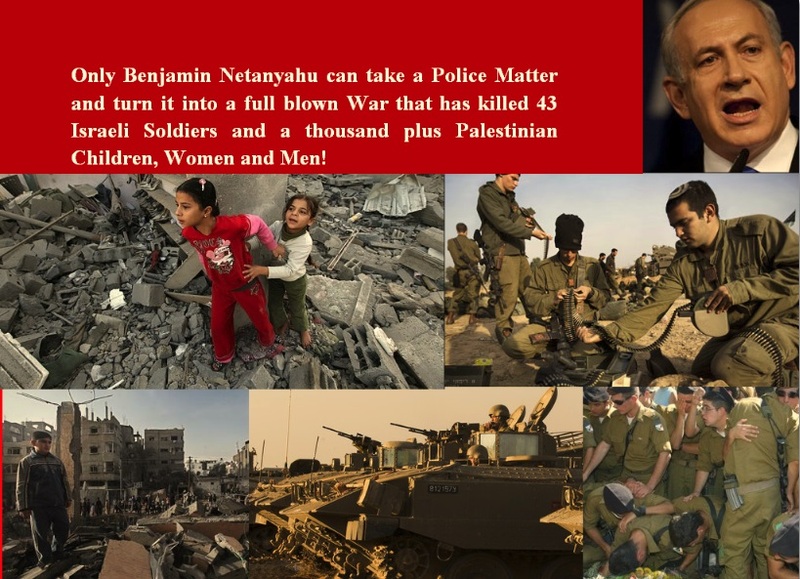 Only Benjamin Netanyahu could take a Police Matter and turn it into a full blow War, killing Children, Women and Men, including 43 Israeli Soldiers thus far. When the bodies of three Israeli teenagers, kidnapped in the West Bank, were found late last month, Israeli Prime Minister Benjamin Netanyahu did not mince words. “Hamas is responsible, and Hamas will pay,” he said, initiating a campaign that eventually escalated into the present conflict in the region. But now, officials admit the kidnappings were not Hamas’s handiwork after all. [Gershon Baskin] pointed out that Hamas had earlier this month signed an agreement to form a unity government with Palestinian Authority Chairman Mahmoud Abbas, bridging, for the first time in seven years, the Palestinian leadership in the West Bank and Gaza. Repeated inconsistencies in Israeli descriptions of the situation have sparked debate over whether Israel wanted to provoke Hamas into a confrontation. Israeli intelligence is also said to have known that the boys were dead shortly after they disappeared, but to have maintained public optimism about their safe return to beef up support from the Jewish Diaspora. 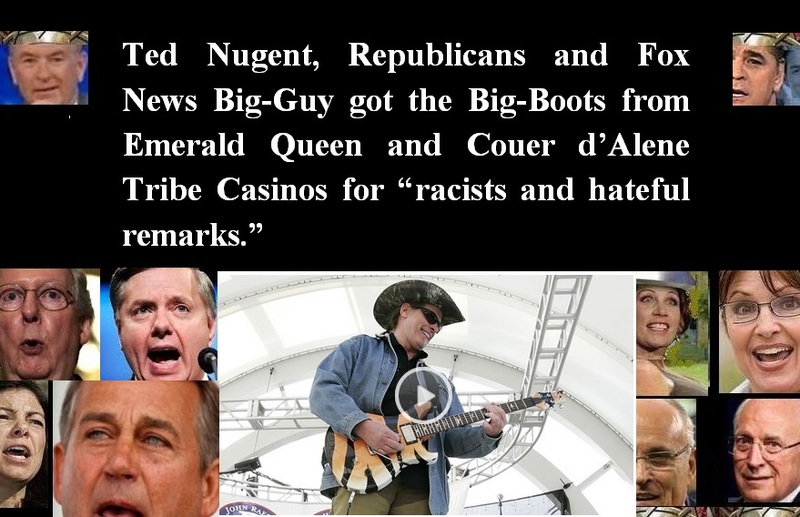 TACOMA, Wash. — Emerald Queen Casino will cancel two Ted Nugent concerts that were scheduled August 2 and 3 over allegations of racist remarks by the singer. Puyallup Tribe officials said the decision came after learning that Nugent has said racist remarks. The tribal council said they also received threats from community members wanting the casino to cancel his shows. The tribe says it booked Nugent without realizing he espoused “racist attitudes and views.” The tribe did not detail which of Nugent’s specific views it opposes. Nugent in the past has referred to President Barack Obama as a “subhuman mongrel.” Nugent later apologized “for using the street fight terminology of subhuman mongrel.” But he maintained that Obama was a “liar” violating the Constitution. Nugent defended himself on Tuesday on Radio.com, saying he is not a racist. Nugent says his music has been influenced by Chuck Berry and Bo Diddley, he has paid tribute to Martin Luther King in his songs, and that lyrics in his song “Great White Buffalo” is not racist toward Native Americans. KING 5’s Janet Kim and Travis Pittman contributed to this report. Fox News misleadingly attacked the federal food stamp program for being wasteful and unaccountable despite reports that the program achieved the lowest payment error rate in its history in the most recently available data.